Bandipur National Park belongs to Niligiri Biosphere reserve and is famous for Tigers. It is an important wildlife sanctuary in the Project Tiger initiative. It hosts a wide variety of animals especially elephants and deers which can be easily sighted. The park is surrounded with other wildlife sanctuaries namely Mudumalai WLS in Tamil Nadu , Nagarhole WLS in Karnataka and Muthanga WLS in Kerala. A famous trekking spot inside the sanctuary is Himavad Gopalaswamybetta. There exist a small road till the top of the mountain. The park is on the way from Mysore to Ooty and on the border of Tamil Nadu and Karnataka. The Moyar river separates Mudumalai WLS and Bandipur National park at the border. For trekking permissions contact RFO Bandipur Ph:082-29636047. There are a number of resorts and cottages available near by. Make it a point to book earlier and come. Here are some contact numbers Bandipur Safari lodge - Ph 082-29233001 Tusker Trails - Ph 080-23618024 MC Resort - Ph 082-29233044 Ambuja farms - Ph 080-26721353 Accomodations near to Mudumalai WLS can also be opted for stay, but you will have to cross the border for which there is a fees to be paid at check post. 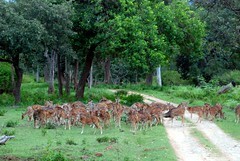 Bandipur National Park is 200km from Bangalore. Route 1: Bangalore - Mysore - Nanjangud - Gundelpet - Bandipur NP. From Bangalore you can reach Mysore in KSRTC and from there you can easily get KSRTC or TNSTC bus to the park. Once you reach the place you will have to venture in to the forest in the vehicles provided by the forest department.